The stock market has done some serious damage to peoples’ retirement funds, altering the plans of many who had hoped to travel extensively during their later years. The automotive industry got the message and has begun making adjustments. And now the RV industry is making changes too. They’re building smaller, lighter weight trailers that can be towed by more fuel-efficient and economical vehicles. For example, smaller Class B motorhomes (like the Roadtrek) are more popular than ever these days. Many people are finding the super-large multi-slideout motorhome or travel trailer are just overkill for their RV lifestyle — especially when you take economic and environmental factors into consideration. When you tally up the cost of a large RV, combined with the higher operating expenses, going smaller is something you might be considering as well. There are many reasons — beyond pure economics — to consider downsizing your RV. For one, as we age, medical conditions can become part of the equation. Stairs alone can become a problem. Many large luxury coaches and 5th wheel trailers require 3, 4, even 5 steps up in order to enter the unit or gain access to the bedroom and bathroom. 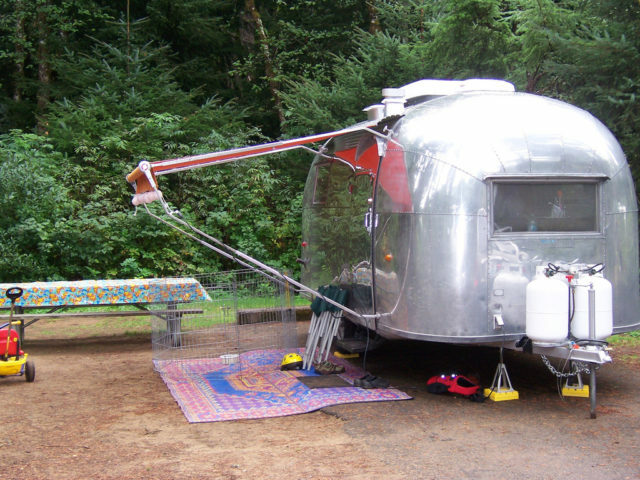 RV storage might be another reason to downsize. In the off-season, a small RV may fit right in your driveway, or even in the garage. 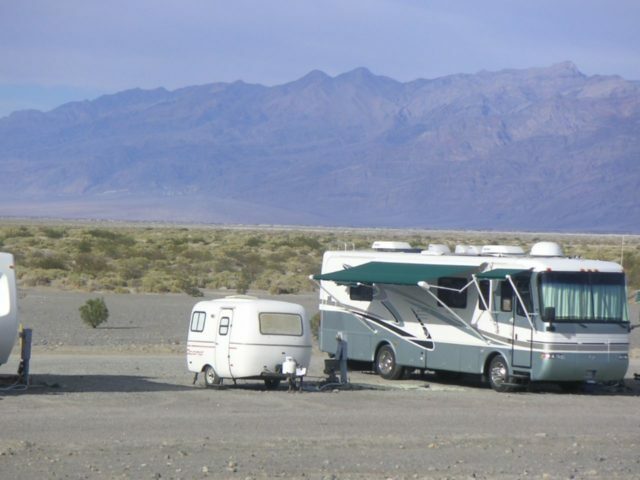 But if you need to rent storage space, you lose the convenience of having your RV close by and easily accessible. Speaking from personal experience, downsizing does come with some sacrifices. After living in a number of very large and spacious RVs, there were some serious adjustments to be made when we downsized to a smaller travel trailer that had less than 1/3 the square footage. Smaller RVs have smaller bathrooms — sometimes to the point of being almost unusable. That’s why, when you’re RV shopping, you should get in the shower, pull the curtain closed and see how easy (or difficult) it is to move around. Many smaller RVs have also done away with the queen-sized bed. Now it’s a full-sized bed at best, and the side of the bed is usually right up against the wall. It may even have one corner chopped off in order to allow access to the bathroom. Sleeping with your nose right against the wall takes some getting used to. I know I couldn’t manage it, so I moved to the folding sofa in the living room and my wife took claim to the bed. Kitchens are usually fully functional even in small RVs. However, the amount of counter space is another issue. This hasn’t proven to be a problem for us yet, as using the dinette table for food prep makes up for tighter quarters. Don’t forget, the refrigerator in a smaller RV is going to be downsized too. In the end, downsizing your RV will mean a smaller bill at the fuel pumps and reduced charges for everything from servicing and repairs to reduced toll charges on toll roads. By moving to a smaller, more efficient and cost-effective RV, many who are finding the RV lifestyle just too expensive for their budget can still travel and enjoy their dream. For some, there may be sacrifices. Others may prefer the coziness and compactness of a smaller RV. It’s all in how you look at it.